Children, Childhood and Cultural Heritage explores how the everyday experiences of children, and their imaginative and creative worlds, are collected, interpreted and displayed in museums and on monuments, and represented through objects and cultural lore. Young people constitute up to half the population of any given society, but their lives are inescapably influenced by the expectations and decisions of adults. As a result, children’s distinct experiences are frequently subsumed within the broader histories and heritage of their families and communities. And while adults inevitably play a prominent role in children’s lives, children are also active creators of their own cultures. As this volume so vividly demonstrate, the cultural heritage of children is rich and varied, and highly revealing of past and present attitudes to children and their work, play, creativity, and human rights. The essays in this book span the experiences of children from classical Rome to the present moment, and examine the diverse social and historical contexts underlying the public representations of childhood in Britain, Europe, North America, Australia, North Africa and Japan. 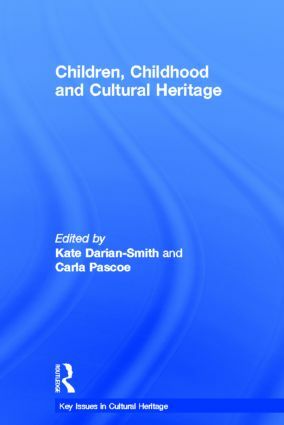 Case studies examine the heritage of schools and domestic spaces; the objects and games of play; the commemoration of child Holocaust survivors; memorials to Indigenous child-removal under colonial regimes; children as collectors of objects and as authors of juvenilia; curatorial practices at museums of childhood; and the role of children as visitors to historical sites. Until now, the cultural heritage of children and the representations of childhood have been largely absent from scholarly discussions of museology, heritage places and material culture. This volume rectifies that gap, bringing together international experts in children’s histories and heritage. Aimed at a wide readership of students, academics, and museum and heritage professionals, Children, Childhood and Cultural Heritage authoritatively defines the key issues in this exciting new field. Kate Darian-Smith is Professor of Australian Studies and History at University of Melbourne, and a Fellow of the Academy of the Social Sciences in Australia. She has published widely on Australian and imperial history; on memory studies, material culture and heritage; and the historical and contemporary dimensions of children’s play. She has held advisory positions with many cultural institutions, and led major research projects in partnership with government, museums and heritage organizations. Carla Pascoe is a Research Fellow at the University of Melbourne, an Honorary Associate at Museum Victoria and a professional historian. She has published a monograph Spaces Imagined, Places Remembered: Childhood in 1950s Australia (2011) and in leading Australian and international journals. She is currently completing a social history of Melbourne’s tram workers, contributing to a biography of eminent Australian H.V. Evatt and teaching undergraduate history courses. Key Issues in Cultural Heritage is a new and unique series which aims to identify interdisciplinary debates within the changing and under-theorized field of Heritage Studies and to explore how they impact on the practices not only of heritage management and conservation, but also the processes of production, consumption and engagement with heritage in its many and varied forms. Each volume brings together a selection of international contributors and global case studies, providing a balance of theoretical and empirical content.